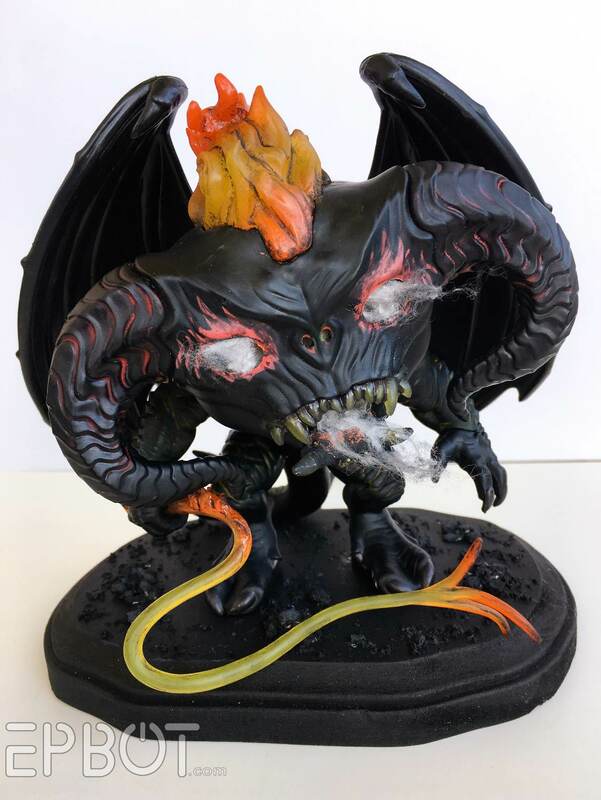 I *do* finally have finished Balrog photos for you! Remember that one? Ages back? When John and I started jamming LEDs into poor Boggy's head? 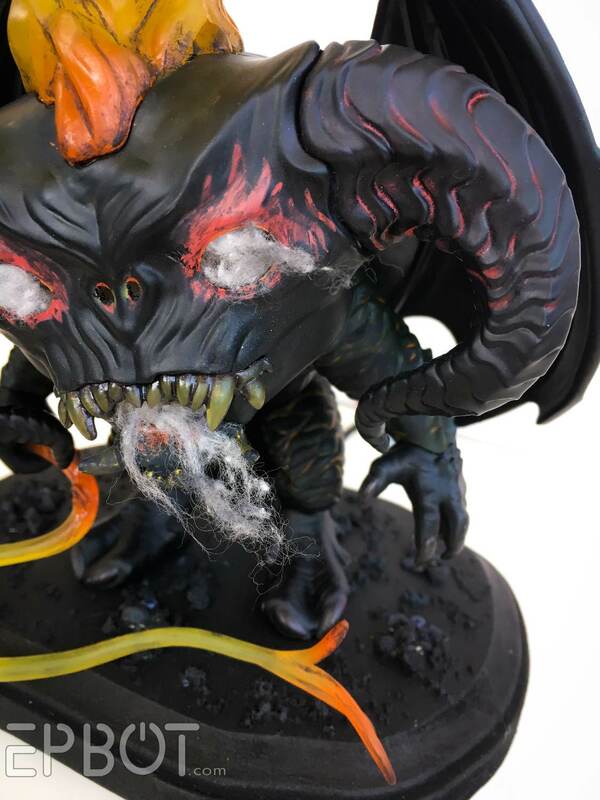 Then again, that's kind of how the Balrog looks in Lord of the Rings, sooo... nailed it? Since my first update we've finished the base, aged the existing paint job, added a few more lights to Boggy's head, and added some cotton "smoke" wisps from his eyes and mouth. Of course it's also essential to "joosh" the cotton just right. That... is NOT right. 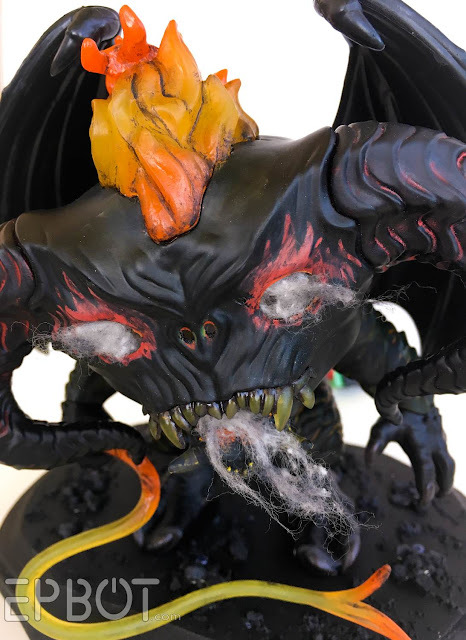 I tried to get the cotton smoke to look good both lit and unlit, so there are only tiny shreds of it. For the base we used - get this - cheap kitty litter for stone gravel, followed up by some crushed walnut shells for the smaller crumbly bits. (The walnut shells are used to soak up spilled paint, so we already had some in the garage.) 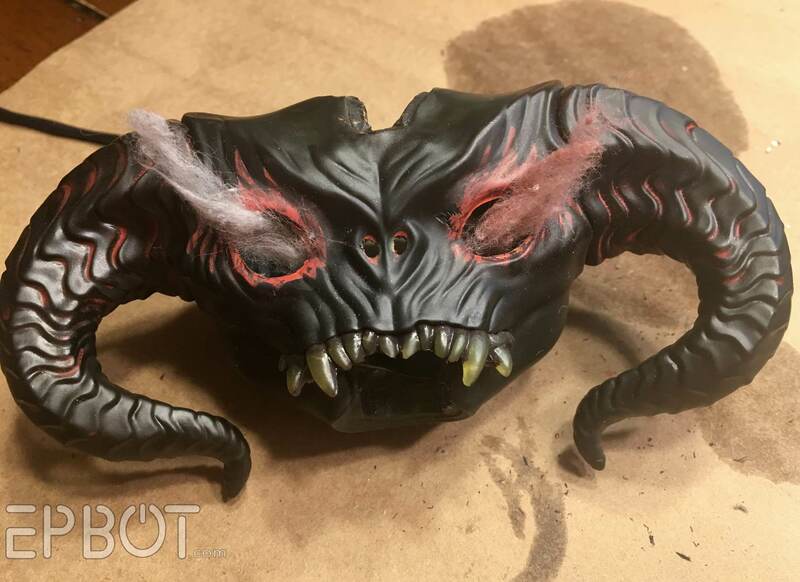 I attached it all with hot glue, then painted everything black. I built up little piles of the gravel to hide the 3 LEDs embedded in the base - can you tell where they are? You can also see my aging better on the whip in that one. I like the black bits near the handle, reminds me of crusted-over magma. Still loving those teeth; they're just so gross, ha. Again, all I did there was wipe off most of the factory brown paint with acetone, revealing the translucent yellow plastic underneath. So that's Boggy during the day, with none of his lights on. Woo woo woo, so fancy. I have to admit I'm bummed the whip doesn't light up - and now that I've pointed it out I'm sure that's all you see, too. (WHY JEN WHY) I originally wanted to fashion something with EL wire - which you could do - but I'd have to make a whole new whip, and then wire THAT in with the other LEDS, and frankly by that point I was distracted by something shiny and ready to be done. If any of you get inspired to do this and make an EL wire whip, though, be sure to send me photos so I can bow before your genius and then glare resentfully at my sub-standard, non-whip-glowy Balrog. You understand "beauty" is subjective here. Aw yeah, werk it, girl. The lights still show reaaally well, since he's recessed a little on the shelf. Hope you liked seeing the finished product, and as always, I hope this inspires some of you to get out there and rip up your toys! FOR SCIENCE! Any chance we can see it lit up in the daylight? 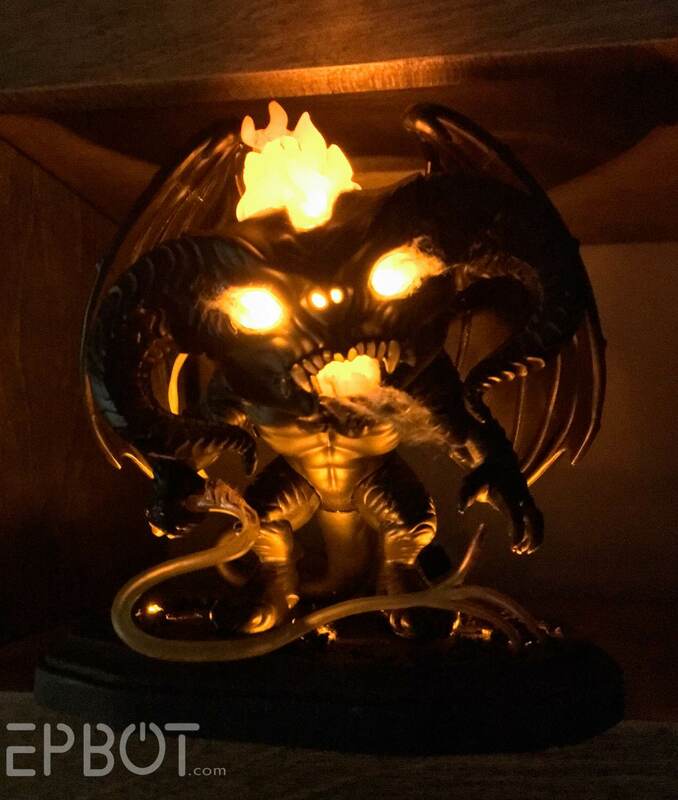 Also, as a mom, I fully support the use of the balrog nightlight in a kid's room. Just have to tell the kids that Bally is there to fight off bad dreams. 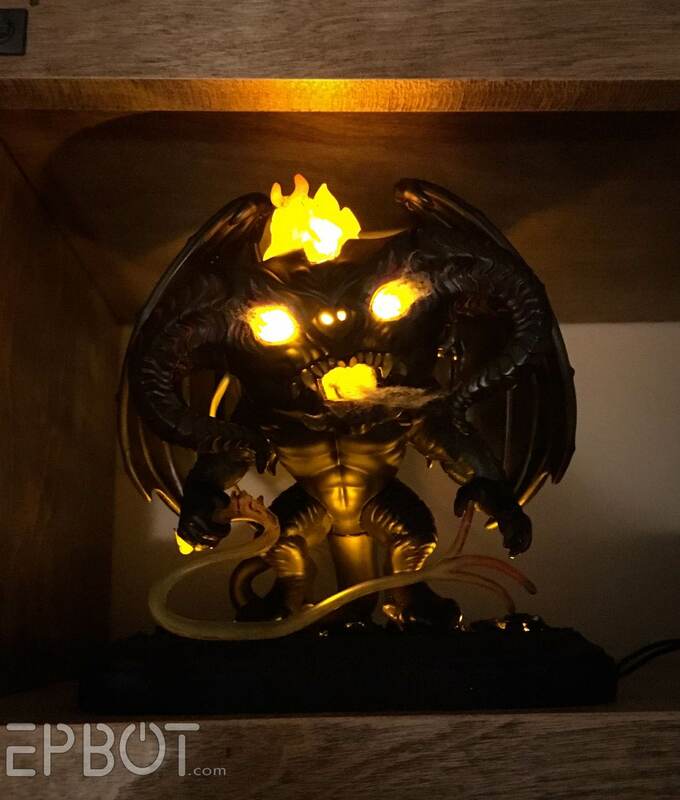 Oops, didn't think to take a picture of it lit up during the day! Lemme do that and I'll add the photos into this post soon. So cool! 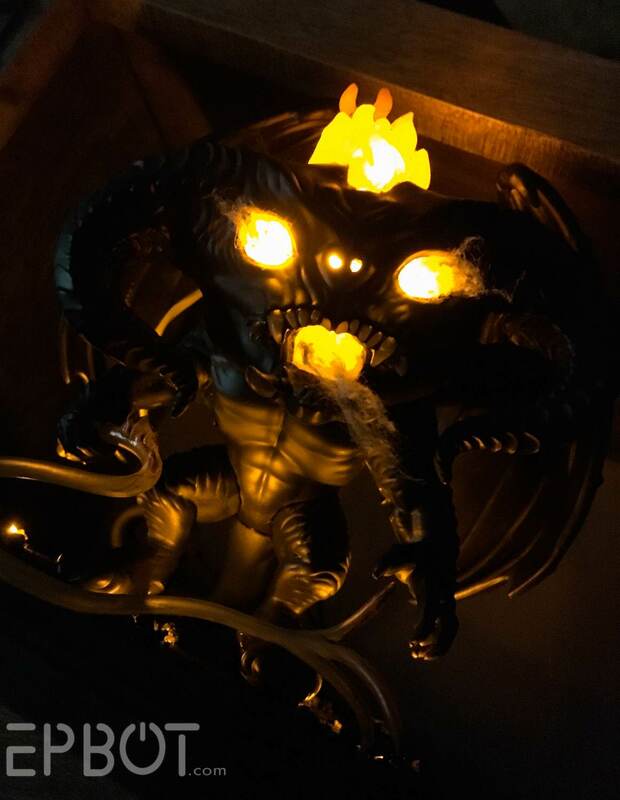 That would have haunted my nightmares if it had been my childhood nightlight. Excellent work! Rather than re-wiring the whip could you paint it with some glow-in-the-dark paint??? I presume it would be relatively translucent by day but beautifully glowy in the night??? That's an interesting idea... 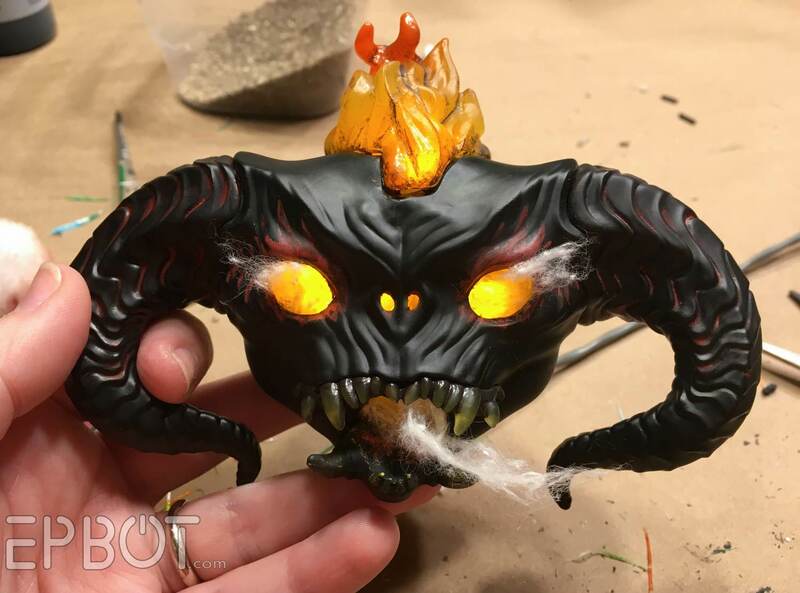 I've seen glow powder that actually glows orange, so if you mixed that with clear coat it might work! This is what I was going to suggest too. Could you glue a fiber optic line or something along the bottom of the whip? I'm having flashbacks to the old light up fountain looking things my best friends grandmother kept in her living room. Another idea here, but for the eyes/mouth flames, after seeing an unrelated tutorial. I wonder if torn dryer sheet would work. You may not get the small balls you can see in the cotton and it may diffuse the light in a slightly different way. I like this idea! Will definitely give it a try. I dont know if this is something you can control, but this post has one of those annoying “you’ve won a free thing” pop-ups that won’t go away. I’m sure that’s not something you want for your blog so I thought you’d like to know. I took a green grab if you want more info. I'm also getting it when I try to view the full blog post in Bloglovin. 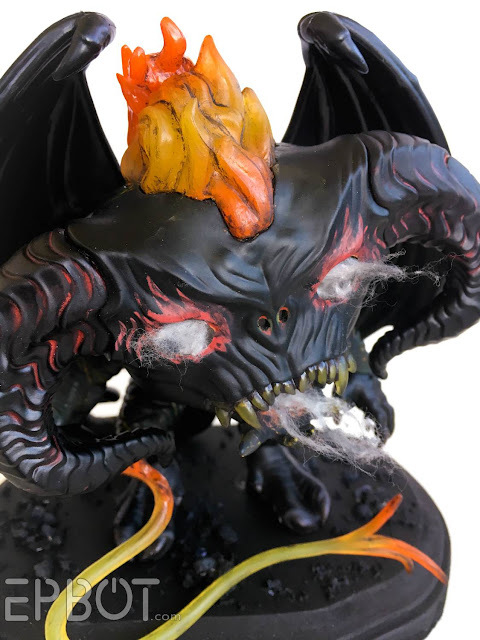 I don't know if it's possible to change it so that the full post shows in Bloglovin, instead of having to click out to open the full post. You could install an ad blocker, some good free ones around including Adblock and Ad-blocker in Chrome...I forget there are annoying things like ads that other people see! Love how well it turned out!! I wouldn't worry too much about the whip, but yeah glow in the dark paint might work! 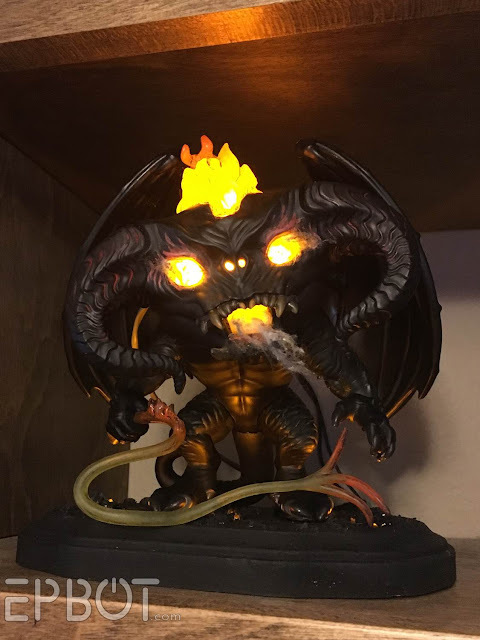 I would TOTALLY use this as a nightlight in my kid's room. I might have to resist the urge to steal it for myself, so I'd need two. Or more. 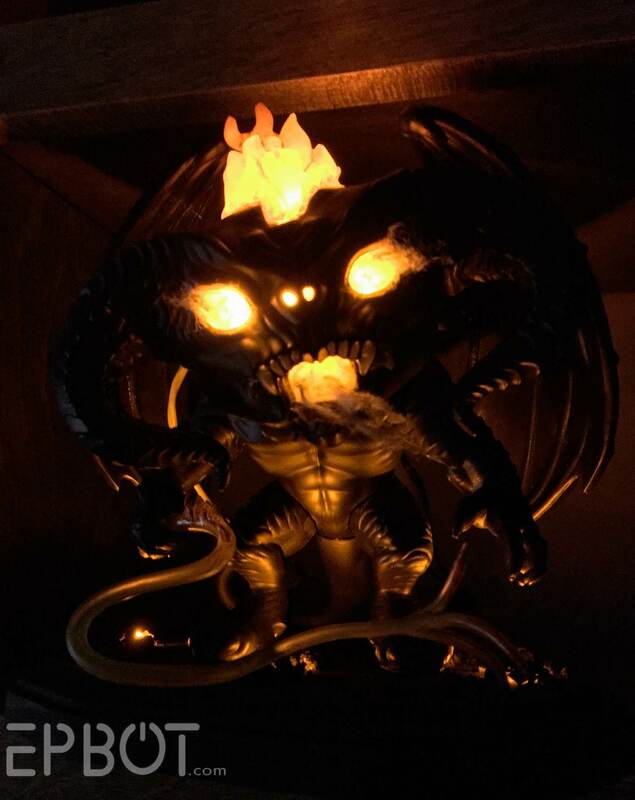 Nightlights for the whole house. That is just AWESOME. I love it! For the whip, could you paint it with some kind of glow-in-the-dark paint? 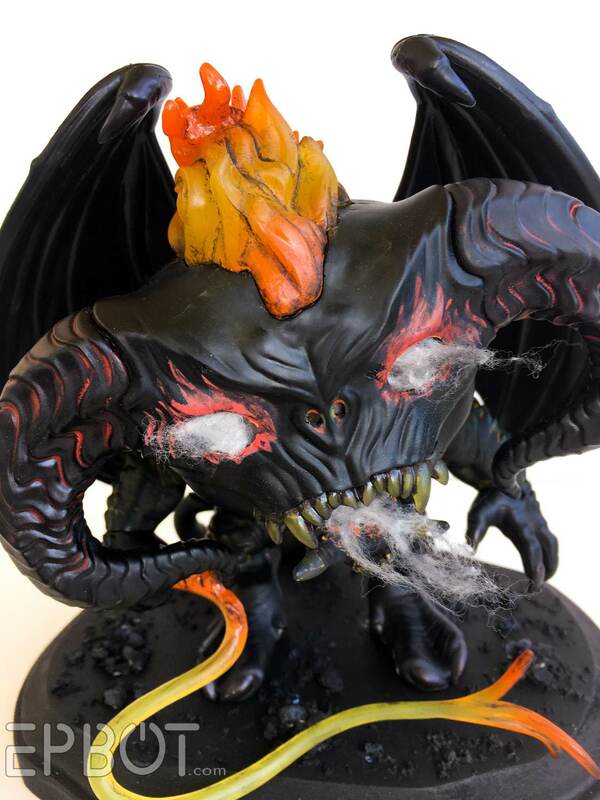 It wouldn't be quite as awesome as the lit parts, but it could have that sullen magma glow. My first thought for the whip was drilling a small hole in the back of his hand and through the start of the whip and sticking a tiny LED in there [the wire for could be tacked out of sight behind his arm]. Mayhaps the translucent plastic would carry some light through the length of the whip -- transparent/-lucent plastic doesn't *always* "wick" light, but one could hope it would in this case. Or you could make a replacement whip out of hot glue and try to see if the "light-wicking" works better with that material. Let's Have Lunch In Pandora!